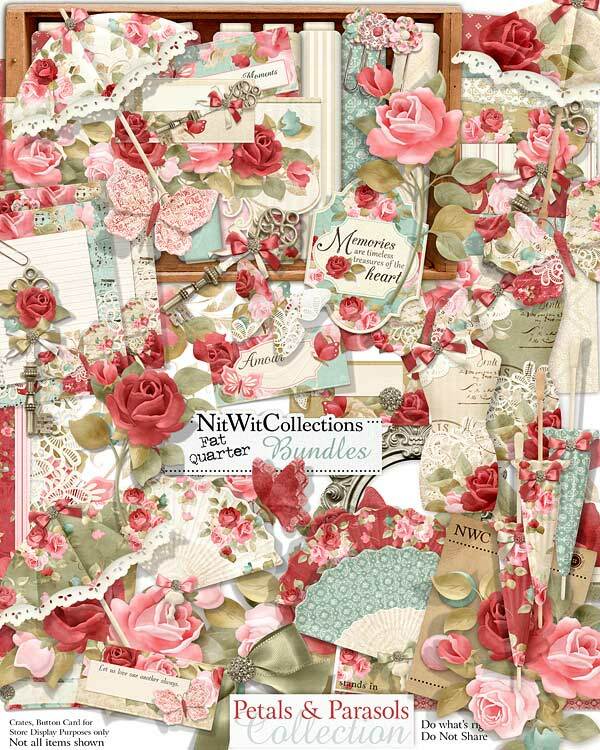 FQB "Petals & Parasols" Collection will delight you with that warm cottage chic or vintage feel for creating your digital scrapbook layouts, cards and mini albums! The detailed digital elements and background papers in this Collection harken back to a time of elegance and beauty. The parasol, fan and dress form all bring your thoughts to timeless style and when you add in the keys, cameo frames, intricate floral clusters and butterflies....your creations will take on such appeal! You may even want to print out the calling cards to leave for your special someone when you've missed them. Try making just one card, scrapbook layout or mini album page and we're sure you'll be hooked on creating with this graceful digital kit. 4 Butterflies, each in a different view and created with different patterns...let them fly! 1 Calling card - "She dreams more often...."
1 Calling card - "Amour"
1 Calling card - "Let us Love One Another Always"
1 Calling card - "Captivating Moments"
3 Keys - the way to the heart! 1 Label - "Memories are Timeless Treasures...."
3 Parasols in full open form....don't they remind you of a posh party scene?? 8 Ribbons in so many gorgeous patterns and colours....try using one in your scrapbook layout, card or mini album and we're sure you'll find these simple digital elements a must to use, always!